The earth has moved such that the soil under my feet is American and no longer Indian. I had fooled myself into thinking sleeping on American time again after two weeks would be no sweat. What a joke. 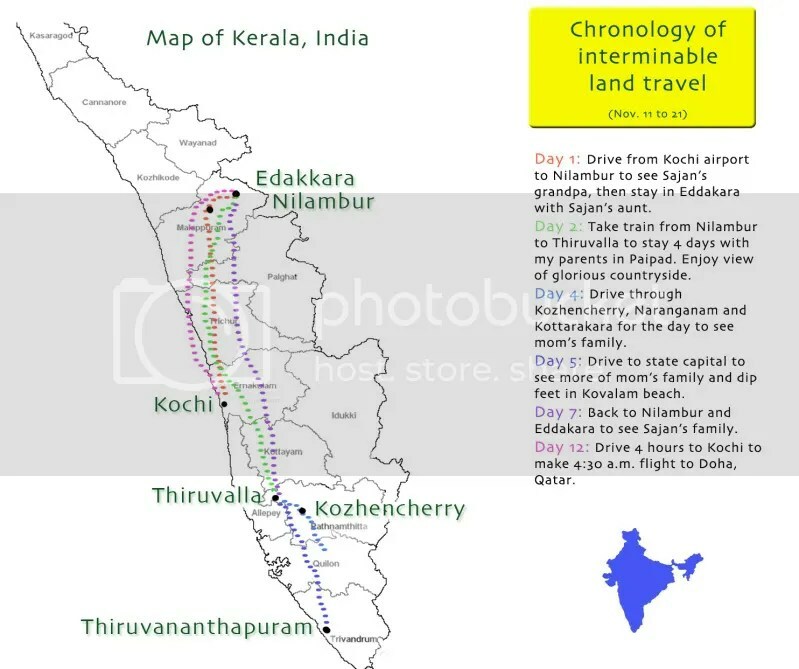 In the meantime, please enjoy this map of our path across Kerala, India to see family, goats, cows, chickens, and tropical paradise. The map may be an utterly boring overview of a completely fascinating trip. Consider it part one in a series of more to come. Long drives in Kerala are not like long drives across Texas. Roads are bumpy and small, so it takes longer to arrive anywhere. Cars don’t have A/C, so you keep the windows down, and the dust and outdoors make their way into your face. After a while, the journeying can really get to you if you are not used to it. But when you are ready to relax, sit and recuperate, you get to breathe the freshest air and take in the view. Nothing can take away the beauty of the landscape and a million other things to enjoy. This entry was posted in houston, kerala and tagged india, journey, kerala, travel, trip. Bookmark the permalink.